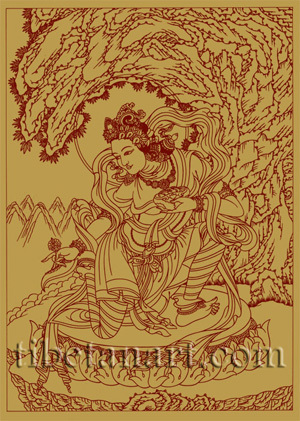 Limited edition of last 100 signed and numbered Yeshe Tsogyal screen prints now available in A4 size (8 x 12.5 inches). Yeshe Tsogyal (circa 757-817), the 'queen of the wisdom lake', was the main consort and foremost disciple of Padmasambhava (Guru Rinpoche). She was born as the auspicious daughter of the king of Karchen in Central Tibet, and by the age of ten she had developed into a beautiful and intelligent young girl, with an incredible memory that enabled her to recall any oral transmission she received. She was also considered to be an emanation of the goddesses Tara, Vajrayogini and Sarasvati. She was betrothed to the Tibetan King Trisong Detsen, who after having received tantric initiation from Padmasambhava presented Yeshe Tsogyal to his guru as an offering. For many years Guru Rinpoche and Yeshe Tsogyal traveled all over Tibet and the Himalaya region giving teachings and blessings, subjugating demons, and consecrating hundreds of caves, hermitages, temples and sacred sites. Together they concealed countless symbolic teachings and ritual objects as 'hidden treasures' (terma), that would later be revealed by tertons when the need for such teachings was great. Throughout the centuries dozens of tertons have 'unearthed' these hidden treasures, some of which have been discovered in earth, rock, sky, mind and through pure vision. Yeshe Tsogyal compiled many of the ancient Tantras through her power of memory, and she transmitted the lineage of Dzogchen or Atiyoga teachings directly from Guru Rinpoche himself. She also wrote a biography of Guru Rinpoche and one on her own life. I based this drawing of Yeshe Tsogyal on a photo that I took of her in 1988 from a fresco painting at the Lukhang Temple in Lhasa, which was commissioned by the Sixth Dalai Lama. She is depicted wearing the clothing and ornaments of a dakini and she bears the twin attributes of a dakini: the vajra-handled curved knife that symbolizes the awareness that severs all concepts, and the skull-cup full of blood that symbolizes the union of emptiness and great bliss.